Only the wealthiest Romans could afford a private house. The front door door opened onto a short passage leading to the 'atrium', a central court or entrance hall. Front rooms on either side of the passage were usually bedrooms. Sometimes, though, they were used as workshops or shops and had shutters that opened out to the street. The centre of the atrium was open to the sky. Below this opening was a small pool to collect rainwater. If you were a guest or had business, you would be shown into the office, or 'tablinium', was often the grandest room of all. 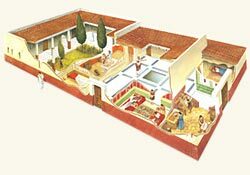 Extremely wealthy Romans also had a summer dining room, which looked out into the garden. The outside of a Roman town house was usually very plan, but inside it was decorated with colorful wall paintings and intricate mosaics. Two sheets of card, pencil, ruler, scissors, self-hardening clay, cutting board, rolling pin, modeling tool, sandpaper, acrylic paint (blue, gold, green, yellow ocher), paintbrush, water pot. When you have cut out all the templates, edge each piece with glue. 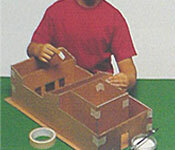 Press the templates together and reinforce with masking tape as shown. This form the walls of your house. 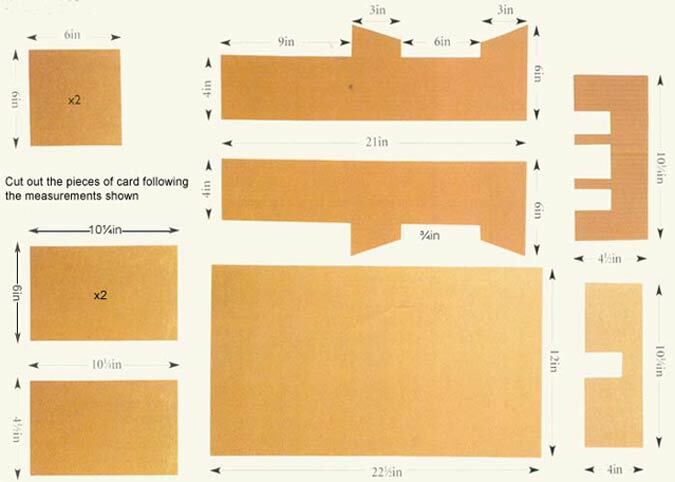 Measure your model and cut out pieces of corrugated card for the roof sections. 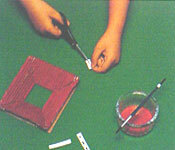 Stick them together with glue as shown above. Paint all of the roofs with red paint. Rainwater running down the roof above the atrium was directed into a pool by gutters and water sprouts. 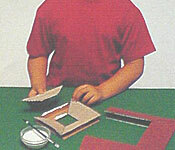 Make gutters from strips of thin card and pierce holes for the sprouts. Paint the walls of the house, using masking tape to get a straight line. Glue on the roof sections. You could then cover the walls of the house with some authentic Roman graffiti. 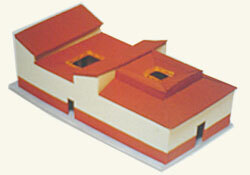 Roman houses had high, windowless walls to keep out the sun, making them cool and shady inside. High ceilings and wide doors made the most of the light from the open atrium and garden. 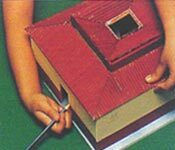 Houses were made from whatever building materials were available and included stone, mud bricks, cement and timber. Clay tiles usually covered the roof. 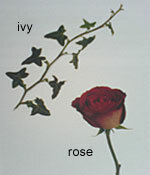 Trailing ivy and sweet-smelling roses often grew in the beautiful walled gardens of a Roman house.